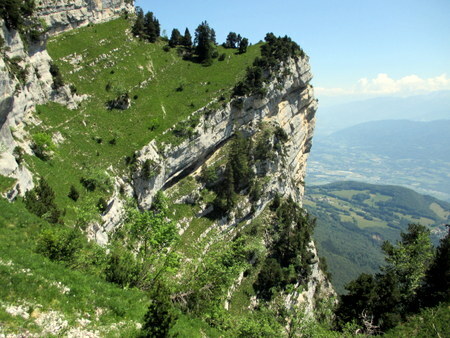 The eastern side of of the Chartreuse Massif is protected by a band of cliffs stretching from Dent de Crolles in the south, to Mont Granier in the north. In some areas these cliffs are vertical, and in others they are a complex of largely inaccessible cirques and sangles, hiding a wonderland of hidden gems such as la Tour Percée. This walk provides an opportunity to get up close and personal with the area, ascending by a rarely visited cirque to reach the Crête du Forneau. The ridge is then followed north and a return made down the major descent route from the col de l'Alpe. It's graded 3 on account of a few scrambles and the lack of way marking during the ascent, and it is best left alone until some experience has been gained in this type of terrain. Nevertheless, it's a fun way up, and a beautiful way down (map). The starting point is Pré Orcel (1405 m, grid ref. UTM 31T 72985 50340). This is reached from les Prés along 4½ km of bumpy forest track. There is a large parking area, information boards, and a water source here. From the car park, take the small path that heads south from the the fountain. This is a delightful path that traverses through the forest. After 40 minutes or so a path joins it from the left, and a quarter an hour later it crosses a small stream. This is followed by a steep ascent, at the top of which is a beech tree decorated with a couple of forestry notices, and white, blue, and orange splodges. From here we leave the main path and head directly up the hill. The vague route is subtly marked with blue and orange blobs, but the basic rule is to stay within sight of the ridge. After 20 minutes of steep going we emerge from the forest, and make our way up under a cliff into a couloir. This is initially best attacked up on the left. Shortly after, back in the thalweg, there are a couple of Grade 2 scrambles. Then, just after having to negotiate some scree, the couloir narrows to a small corridor leading to a small rotting grey crag. At the entrance to the corridor, climb up on the right to find a path climbing up to beneath the buttress forming the cirque's right hand wall, on top of which is perched the feature known as The Caiman. Once under the buttress, the path traverses round into the adjacent cirque. This is very beautiful but steep with a couple of rocky steps requiring Grade 2 scrambling. The route is not always obvious, but there are some orange blobs placed in strategic positions to give you a clue. Below the upper cliffs, the path traverses back and climbs up to a terrace above the original cirque. After a few minutes there is an unobvious junction, where a narrow gully ascends to the right, and a path continues to traverse beyond a 2 metre drop. We go up the gully, which involves a 5 metre Grade 3 scramble, but just above this the path joins the crest where there are wonderful views towards Mont Granier to the north, and the Col du Bellefont to the south. Once on the ridge, we turn north. From here, the route is better way marked, and mostly more obvious underfoot, although some care is required with the navigation in places. It rises up to a splendid little summit (point 1830 m on the map) with a grassy top and a trig point. Judging from the charred state of the trees, this area seems to be very vulnerable to lightening strikes. The next section of path is very beautiful, traversing a broad ridge with dwarf pines, and hidden glades, made use of by the local sheep. The Pas de la Rousse, an alternative asscent route, is marked by a large cairn, with a prominent pinnacle topping the northern wall of the cirque. A few minutes later the path starts to descend to arrive at a col after a further 20 minutes. Straight ahead, carved inscriptions on the rock denote the 1822 boundary between France and the Kingdom of Sardinia's Savoy territory - the red and white cross being the coat of arms of Savoy, and the fleur de lys being the official emblem of the kings of France. Ignore the path going off to the left, and head towards this. This path ascends a little before emerging at the head of the Vallon de Practel. The Col de l'Alpe, embellished with a boundary stone, is a fine place overlooked by the Croix de l'Alpe. From here, we follow a transhumance path back down - some of it has been carved out of the rock and is a little uncomfortable underfoot in places, but it's an impressive route with some fine views of the surrounding cliffs. After a couple of hair-pins, the Cabane Forestière de l'Allier is reached. A few metres beyond this is a footpath going off to the right which takes you directly back to the car park.